Back off four side to side alignment screws in both top and bottom stirrups. 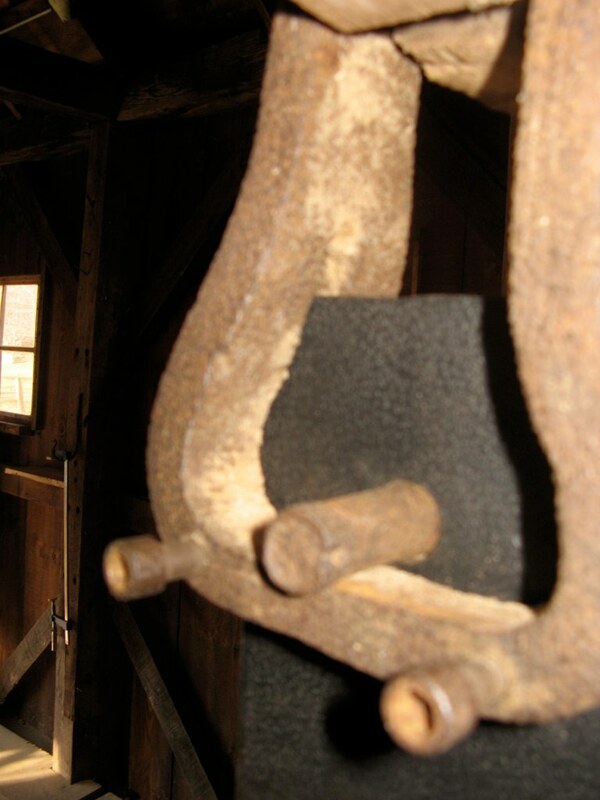 Insert metal pin through hole in blade so that the saw hangs from the upper stirrup; repeat for lower stirrup. Hand tighten the nuts on the top yoke (but do not tighten completely to allow for alignment). · Set the long axis of the blade parallel to the fender post rails. 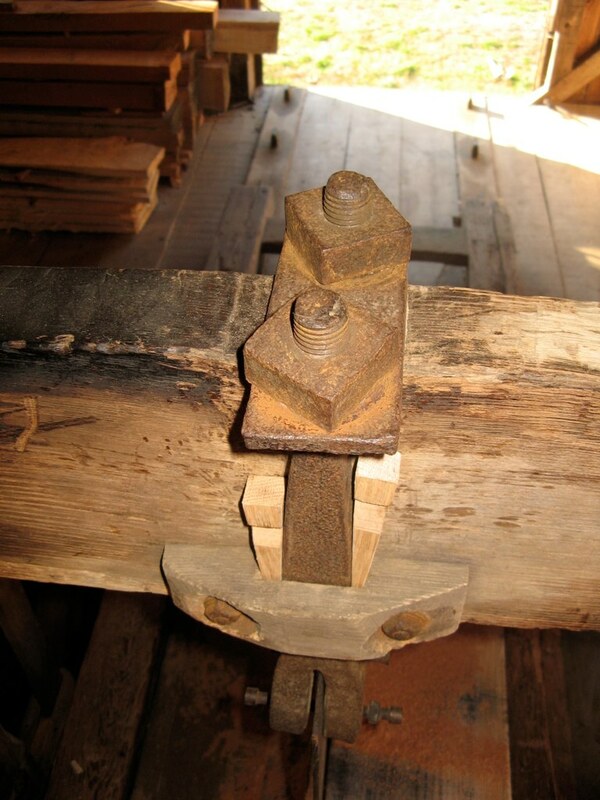 The fender post metal rails (upon which the wooden saw frame rides) are not necessarily plumb, so the saw should be set parallel to the rails, not set to absolute plumb. Using a gauge stick is more convenient than multiple measurements with a ruler. Hand tighten the four bolts on the sides of both the top and bottom yolks to roughly center the blade in the yolk. Now check from the right rail, as you look at the saw from the front, to see if the top and bottom are equidistant from the rail. It is not a bad idea to check it again from the left. 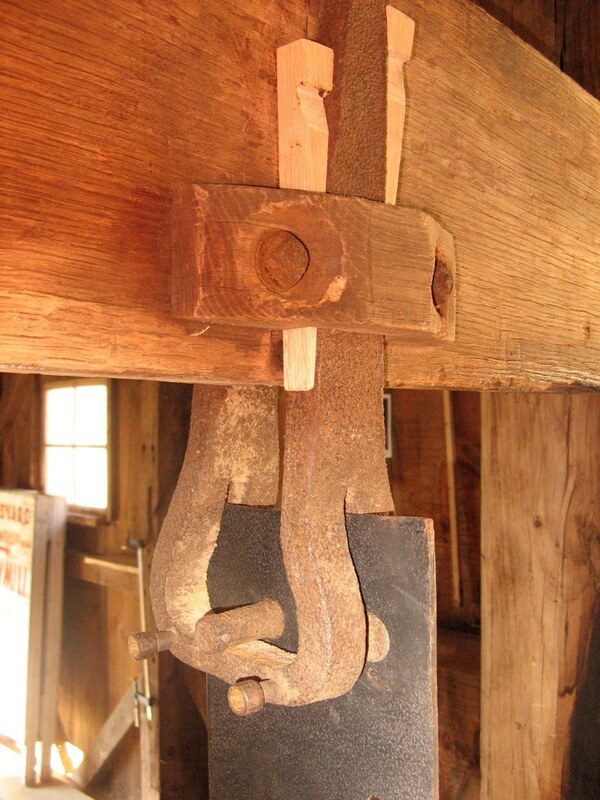 · Adjust overhang (blade rake) so that upper teeth are 3/8” - 1/2” further forward than the lower teeth. Hang a plumb bob from the uppermost tooth and measure from the bottommost as in the illustration. 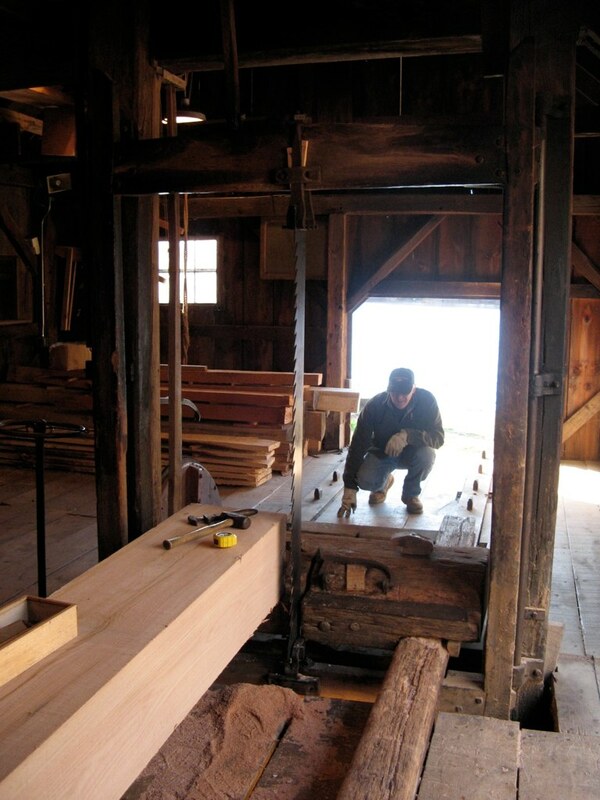 “…this is to give the saw liberty to rise without cutting; and the log room to push forward as it rises.” - The Young Mill-Wright and Miller’s Guide (see note below)) . Line up the blade with the path of cut to remove twist. 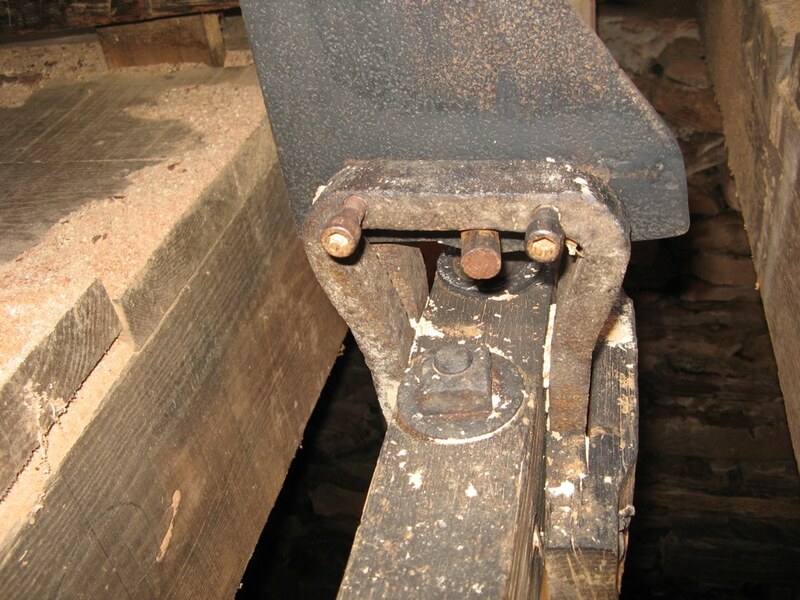 Fix a scrap block of wood in the carriage tail block and run the carriage forward to let the saw teeth mark the scrap block. 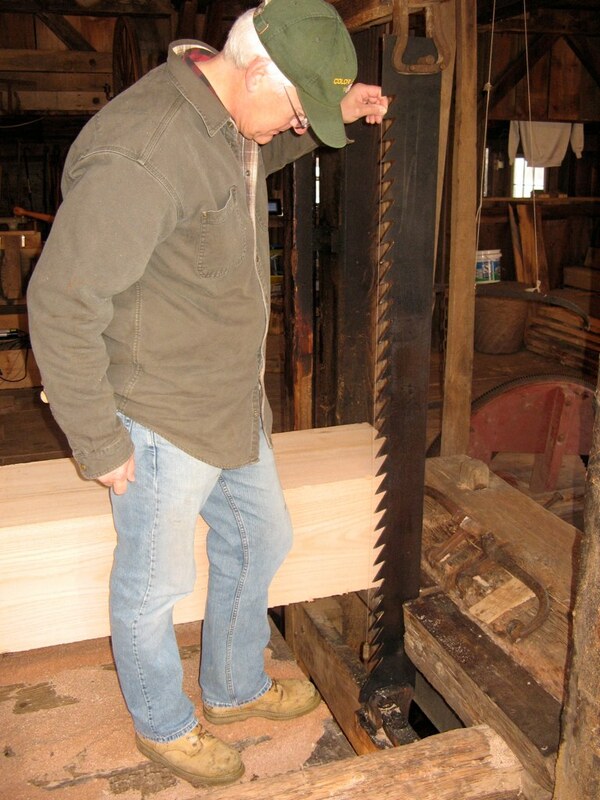 Reverse the carriage back to the starting position and sight down the blade to the sawn mark on the scrap block. Adjust the screws on the top yoke and the screws on the bottom yoke to align the blade angle parallel to path of cut. Sight and adjust both the upper and the lower part of blade so there is no twist in the blade. An absolutely straight winding stick clamped to the side of the blade where it is not deflected by any tooth set aids in establishing a citing a line. Is blade parallel to the fender post rails? Is its lined up with the path of cut with no twist? After the nuts are tight, recheck again as above. As a final test, clamp a stick close to one side of the blade with the headstock dog. Then open the gate to start the saw, but do not engage the carriage. The gap between the stick and the blade should not change during the full length of the stroke if the blade is moving up and down in the same plane without twist and parallel to the friction tubes. [Classic source: - Evans, Oliver. (1795). The Young Mill-Wright and Miller's Guide. Philadelphia: Lea & Blanchard. Originally published 1795 with 15 editions to 1860. 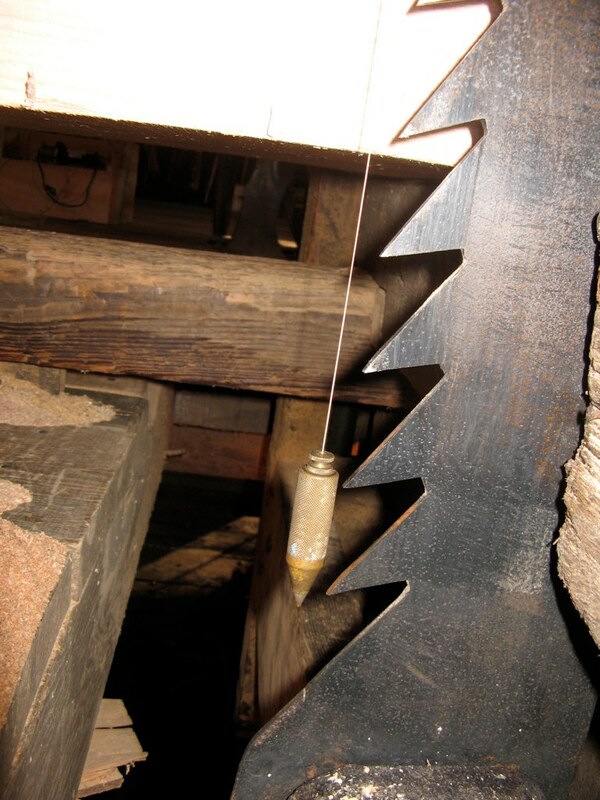 The chapter on sawmills (XXII or XXIII in different editions) is written by Thomas Ellicott and contains the classic and most frequently cited primary text and diagram (Plate XXII or XXIII) of a sash sawmill.] See also Parsons (1857), The Sawyers Companion.